Chickpeas are a traditional treat to serve at a Shalom Zachor, a sweet little party given in honor of the birth of a baby boy, held the first Friday night after the birth, with or without the guest of honor. Sumac, a Middle Eastern spice unrelated to the poisonous plant, offers an herbal piquancy to chickpeas, that is lemony, too. Just beware when you serve these humble legumes: everyone is going to ask you about the identity of that elusive rosy spice. In a small bowl, combine the sumac, smoked paprika, coriander, salt, and black pepper. Toss the chickpeas with the spice mixture and the oil. 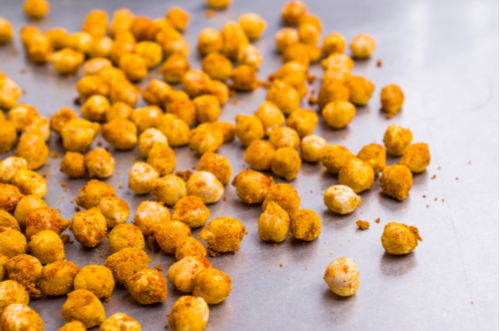 Spread chickpeas into a single layer onto a parchment paper-lined cookie sheet and bake at 400°F for 15-20 minutes. Increase the temperature to 450°F and bake for an additional 10-15 minutes. Sprinkle chickpeas with chopped parsley and serve.